This beautiful book will have you captivated! 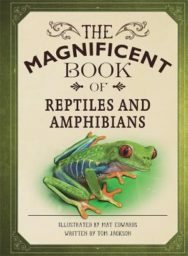 From a terrifying king cobra to a tiny red-eyed tree frog, a rare Galapagos tortoise to a bright Parson’s chameleon, The Magnificent Book of Reptiles and Amphibians is the perfect introduction to these fascinating creatures. Each stunning, detailed illustration is accompanied by intriguing facts, amounting to a wonderful keepsake that you will revisit time and again.